During the fall and winter months, cooler temperatures can create problems for animals, especially birds. Because our feathered family members are at greater risk of developing respiratory problems, it is critical that owners taken appropriate measures. In addition to cold air, mold, spores and dust on heaters often can also pose significant risk especially for the northern states that use furnaces. I’m always asked “how cold is cold and how hot is hot in terms of being outside for my birds?” Here in Florida we have some of the best temperatures of the world and it never gets too extreme but it can dip down into sub-optimal conditions for our tropical birds. If we are always aware of the wind, 55-60 degrees would be the lowest we recommend to leave your bird outside. It can be 68 degrees but with high winds and humidity it can feel like 50 degrees so always use common sense in regards to leaving birds outside with no housing to hide from the elements. As I have discussed in other articles the highly efficient respiratory system, changing a bird’s ambient temperature greater than 15 degrees too fast can affect their respiratory system adversely. Allow me to elaborate on this system further so bare with me because it is important. Included in upper respiratory infections in birds is the cere, an area located near the top of the upper beak. Depending on the bird species, this area may or may not be covered with feathers. Within the area of the cere are the nares or nostrils through which air moves into the nasal cavity. In birds with chronic upper respiratory infections, these are typically shaped abnormally. 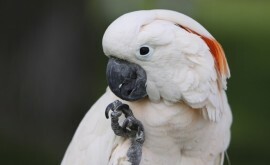 The nasal cavity itself in most species of parrots is divided by a nasal septum. Then in the lateral wall of the nasal cavity are the conchae. a cavity that is highly vascularized. The scroll shaped cartilage covers the nasal mucosa and the infraorbital sinus is designed to drain through the top of the middle section of the conchae. Often when a bird has an upper respiratory infection, this area will become plugged with pus and mucous. As a result, the bird will experience swelling around the eye. Then extending into the upper and lower beaks, around the eyes and ears, as well as connects with the cervicocephalic air sac at one end is the infraorbital sinus, allowing air, as well as dust and mold to flow through. As far as the lower respiratory tract in birds, this begins at the tracheal opening, to include airways and gas exchange surfaces. This is comprised of the trachea, larynx, syrinx or voice box, main bronchi, and parabronchi, which are small tubes within the lungs used to transport respiratory gases. Also included in the lower respiratory tract are air capillaries of the lung parenchyma and paired air sacs, which are interconnected. The air sacs along with the lungs make it possible for more oxygen to exchange. 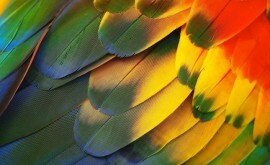 Both mammals and birds have active inspirations while the active process expires only in birds. For this reason, birds must move the chest wall for inspiration, as well as expiration. Typically, gas exchange occurs within the air capillary walls, equivalent to alveoli in birds. Also similar to the anatomy of mammals is the blood gas barrier that consists of a common basal lamina, air capillary epithelium of squamous cells, and endothelial capillary cell. The only difference between mammals and birds is that in feathered species, the blood gas barrier is thinner. Birds also have much smaller air capillaries that allow a larger number of air capillaries within a space. The small diameter of these capillaries is what creates a serious risk when birds become sick because of taking on fluid within the lungs. Overall, birds are far more efficient than mammals when it comes to capturing oxygen and eliminating carbon dioxide but with birds, fluid in the lower respiratory tract can accumulate fluid when an infection exists. Whew! Sorry that was so clinical but you now see how REALLY efficient and yet susceptible the respiratory systems of birds are. It is also important for bird owners to pay attention to both behavior and health. A healthy bird should be active and breathe normally. If a bird has a respiratory infection, the tail might bob up and down as the animal tries to breath, the feathers will often fluff up, and the nares will be filled with debris. If these signs appear, the bird needs to be seen by a qualified avian veterinarian right away. Another aspect of fall is the change in the amount of daylight. In some birds, more dark hours can trigger unwanted behavior. For one thing, sexual behavior may diminish in certain species but increase in others, nesting habits change, and birds might begin to fight with other birds. Unlike amazon parrots and conures that have higher sexual and breeding interest during the spring and summer, cockatiels show those behaviors in the fall. 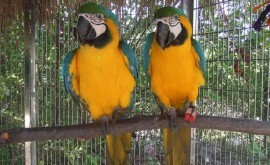 For instance, in December and January, captive macaws, african grey parrots, and large cockatoos often breed although they may also have a spike in reproductive behavior in mid-summer. Some owners feel that artificial lighting is a good option during the fall and winter months but in many species, this actually makes it hard for the animals to differentiate between normal and induced behaviors. If someone were interested in reducing reproductive behaviors in birds, specific triggers that occur in the wild should be considered. Sometimes and without intending, owners recreate the same triggers. For instance, covering a bird’s cage may cause the animal to see the act is a palatial nest box. In addition, providing birds with foods high in protein and fat can create food variety found in the rainforest, which in turn signals reproduction. No matter the time of year, petting a bird the wrong way also sends mixed signals. If a bird is petted down the back toward the tail feather, it causes sexual stimulation. With this, the bird views the owner as the mate, which prompts reproductive behavior. Instead, experts recommend petting around the head and along the cheek feathers. The bottom line – Fall not only changes senses in humans but bird species as well. Drafts, molds, and dusts can cause respiratory infections while light alteration changes behavior specific to reproduction. By making a few adjustments and paying attention to the bird, an owner can enjoy the fall and winter season without any problem.